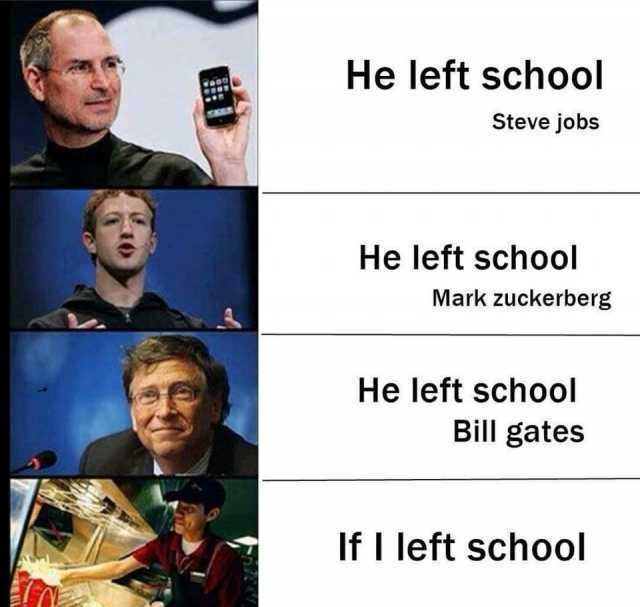 Despite dropping out, Gates, Jobs, and Zuckerberg were immensely successful because of the alignment of many factors: connections (for elite universities, attending can be as valuable as graduating, due to connections), high IQ (which allowed them to get into such universities and be so successful at tech ), access to capital (to fund their start-ups), and being in the right place at the right time (the personal computer revolution, which was made possible due to the invention of the transistor). Hard work helped, yes, but it is a necessary but insufficient condition, and there many people who work hard and fail, yet you never hear about them. Overall, entrepreneurship is overrated. 5 successes for every 100 failures, and the successful ones will try to tell you that their success is attributable to some sort of special skills or rules (hucksters like Gary Vaynerchuk, who looks and sounds like a used car salesman), when it’s either luck, having rich parents, or some other variable outside of one’s control (Gary inherited his family’s wine business). Regarding Bill Gates, in addition to having very high IQ (Gates got a near-perfect score on the ‘old’ SAT), which is also luck, as Philip Greenspun notes, his upbringing could not have been more fortuitous. Writing books, selling on Amazon, or doing podcasts, is too much work, has a high failure rate, and pays poorly relative to things like investing, unless you’re Sam Harris or Joe Rogan. People are all impressed that their book is #1 on Amazon in some obscure category, or their book sells a couple thousand copies, or their podcast has 1,000 downloads, but that requires a 1-1,000 rarity talent and or IQ, whereas anyone regardless of talent can invest in the S&P 500 and make money much more easily. Or any low-skilled job pays more. The median success for the typical podcast, Amazon seller, or self-published author in terms of income, after one factors in the number of hours involved and start-up costs, amounts to less than minimum wage. The most successful people I know didn’t do it with entrepreneurship, but rather they got good-paying jobs, kept expenses low, and invested whatever was left in the stock market or real estate, taking advantage of compounding. For every college dropout success story like Jobs, Gates, Zuck, etc., or someone with a successful podcast, there are countless failures who are stuck in fast food or retail. All over Reddit on popular subs such as r/wallstreetbets, /r/investing, r/financialindependence/, and /r/personalfinance, there are tons of stories of people in their 20-40′s who have gotten rich in finance and other high-paying jobs and by investing, thanks in large part to post-2009 tech and stock boom, which a decade later continues with no end in sight. It’s not like I have to dig deep for financial success stories, but just within a few minutes of skimming one can find many young people striking it rich with investing and tech. There’s even an entire sub-culture surrounding this: the so-called ‘FIRE’ movement. Not too many FIRE disciples are writing books , doing podcasts, or selling on Amazon or Ebay. A traditional job lacks the autonomy of entrepreneurship, but cushy working conditions, a six-figure salary, and generous stock options makes it worthwhile, especially when one considers that the median hourly wage from entrepreneurship is less than minimum wage. A single decade in tech can equal many decades of lower-paying work. Regarding entrepreneurship versus investing, if I had to choose between putting a large sum of money, say, $200,000 into a small business, which has a 90% chance of failing within 5 years, or the S&P 500, the choice is obvious. Buy the dip has been a winning strategy since 2009. Look the S&P 500 since the start of the year: strait up without a hiccup. Out of the ruins of the 2008 crisis came possibly the biggest and longest technology and stock market boom ever, that so few could have anticipated and the media ignores, instead focusing on all the things that are going wrong (such as the Mueller investigation) and not what is going right (the strong economy). I don’t want to turn this into a politics post, but I think this lopsided reporting is motivated by biases that fall along predictable party lines. If I had to predict how much higher the stock market is going rise, my response is, much higher. Due to a combination of robust consumer spending, low interest rates, geopolitical stability, PE multiple expansion, and strong earnings, the S&P 500 can conceivably post 15% annual returns (including dividends) for the next decade (for a total of 300%), which is similar to that of the 80′s and 90′s. It may be a decade or longer before there is another recession. Pension funds and passive investors are pouring money into the market because bond yields are too low to meet obligations. In our post-2008 winner-take-all capitalist system, with huge winners few and far between and lots of losers, riding on the coattails of the winners (or as Josh Brown says, Own The Damn Robots), is a way better strategy than trying to create the next Facebook or the next Google (many have tried and all failed). Given that the tweet was ‘favorited’ over 1,110 times, many people agree these pundits are worse than a broken clock in that they are never right. When Facebook went IPO in 2012 and the stock failed to ‘pop’ (as most IPOs tend to do, but this was not the fault of Facebook, but rather the stock being underwritten at an appropriate value, which worked to Facebook’s advantage), the experts proclaimed it as “the top” of the web 2.0 and tech boom, which in retrospect was wrong; now Facebook stock is up 300% since then and Facebook’s earnings have grown so much that the PE ratio of Facebook is only 20, versus 100 when it debuted. The experts underestimated the boom in mobile advertising and content, which in 2012 was underdeveloped compared to today. Also, it’s impossible to know what inning we’re in. But it does not matter. If you are making a solid six-figure salary and you invest and save diligently, then even if the tech boom was to end next year, you would still come out ahead by virtue of having more money. What these alarmists don’t understand is, you keep the money you earn. It’s not like you have to give everything up when the market turns. And even in 2000 after the tech bubble burst, it took less than three years for things to pick up again. Tech, unlike housing and energy, tends to be very resilient to macro economic forces and recovers quickly. Even the S&P 500 made a new high within 6 years of the 2000 peak and 6 years after the 2007 peak, so you didn’t need to wait that long to recover all your money even with the worst possible timing. Some blame this on the fed for ‘artificiality inflating economy’, and no doubt, low interest rates help, but companies are making tons of cash, too. Multinationals such as Disney, Walmart, Visa, Nike, Google, Microsoft, and Facebook are generating billions of dollars in free cash flow every quarter; this is indicative of actual economic activity and demand, not just artificial fed stimulus. America has among the highest per-capita income of all developed countries, higher than that of Germany and the UK, and with 330 million Americans, that is a substantial amount of purchasing power flowing into the economy. But what about living expenses? For sure, Silicon Valley and New York are expensive, but if you are single and keep expenses low, then even in a high cost of living area you can still save and invest a large percentage of your income. Yeah, if you have many dependents, the picture changes, but I think much of this hype and alarmism over high Bay Area living expenses is overblown. Just running the numbers: If you make $210k/year, after taxes you are still taking home $135k/year. In Silicon Valley, the median rent for a one-bedroom apartment is $2,300 a month. So you are still left with $107k. Subtract $1,500/month for other misc. expenses such as food, health insurance (assuming employer does not cover it), internet access, phone plan, and car payment for a used car. So you’re left with $89k, which is no small change. This is not even counting stock compensation or sign-on bonuses or other perks. Of course, if you add children to the equation, expenses rise dramatically, but this can be offset to some degree by having a double income family. How about student loan debt, as the meme below shows? Again, similar to high living expenses, I think these fears are overblown, and outcomes depend on variables such university ranking and choice of major, as opposed to the generalizations by the media and pundits such as James Alucher that college is too expensive and not worth it. The typical student has $20-30k in debt, which is the cost of a new car, but unlike car, a degree gains value in terms of higher inflation-adjusted wages whereas a car losses value, yet there is much less alarmism over car debt. In spite of the anti-college movement, since 2009, the gap between grads and non-grads in terms of wages and employment rate is the widest it has ever been, so these pundits and gurus could not have chosen a worse time to tell people to not go to college. Yeah, if this were the 80′s, for sure, college would not be necessary. But this is 2019, which is a much more competitive, automated, and globalized economic environment where in spite of low unemployment, the labor market for many jobs is flooded, and salaries follow a bimodal distribution, with a lot of low-paying jobs in the service sector, some high-paying tech and legal and medical jobs, but not enough job in the ‘middle’ due to the decline of manufacturing. The evidence suggests that in spite of the debt, college grads, especially in STEM, finance, and econ do well, but I have read stories of liberal arts majors such as philosophy doing well. On Reddit, subs devoted to finance and investing, it’s almost without fail that those who have the most money have college degrees and are in tech, not small business or entrepreneurship. Even with $50-100k in debt, it’s spread out over a long time, so if your job pays $100k a year, the student loan payments are only a small fraction of your income. $10k/year in student loan payments for a 70-100k+/year job seems like a good deal. Also, there are tons of forgiveness and deferment programs, so although the debt is very hard to discharge, the terms and interest rates are much better than other types of debt such as credit card, consumer, home, or auto debt. The 2005 changes to the bankruptcy law made other types of debt much less forgiving relative to student loan debt. A solution is limiting loans only to applicants who have the highest likelihood of finishing college, such as requiring a minimum IQ or SAT score to qualify. Just merely having a GED is not good enough. Part of the problem is economics: employers, for many industries, have a glut of workers, and requiring a degree is a cheap and low-risk (in terms of legal risk) way of screening candidates for competence. In conclusion, if you have the corrections, funding, (always use other people’s money, never your own), and a truly ‘great idea’, then go for it, but this does not apply to most people, who have neither funding nor a good idea.